The Logan County Sheriff’s department confiscated nearly 20 machines from five Guthrie convenience stores that were involved in an illegal gambling operation. 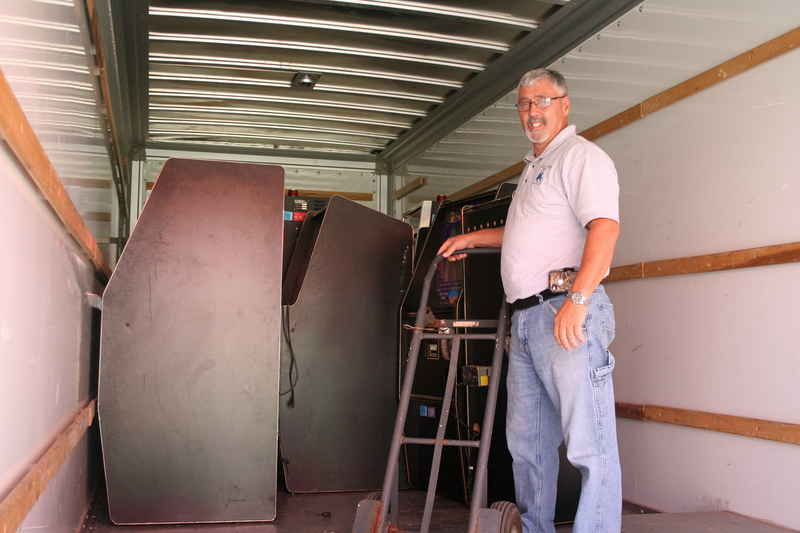 Sheriff Jim Bauman and deputies confiscated nearly 20 machines that were being used for illegal gambling. The department has been investigating the gambling operation for six months. On Monday afternoon each of the six convenience store were closed down for a time while the machines were removed. Deputies could be seen moving the machines out of the stores into a Uhaul truck. Chief Deputy Rob Groseclose told Guthrie News Page that customers would go inside and gamble, get a ticket or coupon and go to the cash register to receive their cash out. The convenience store would generally pay out with store funds. The Deputy said the stores and owners of the machines generally split the profits. Groseclose went on to say some of the store owners did not even know the last name of the machine’s owner. There were no arrest during the operation, but are expected in the near future. “Today is about equipment and money. We will follow-up with arrests. I’m sure they will follow,” Groseclose said. 22 Responses to "Deputies confiscate gambling machines from stores"
There is a clause in the Oklahoma law that states if law enforcement (sheriff) has known about illegal gambling going on for any substantial amount of time, then they themselves will have charges filed upon. I guess when these gambling places face the music then so will these law enforces.How will they deny the length of time these machines have been in town when they are sworn under oath in front of a judge? Or were they not aware of them in town for all these years. Sounds like they’ve been covering for these places for years but now since election is here someone needs a good photo opp. I know witch sheriff I’m not voting for. It’s about time they did get rid of these from the town though. They didn’t take them from all the places! They are still in the bars, bowling alleys, golf course and VFW. They selected by ethnicity and race for their raids. It’s kind of funny how all the places that got raided were asian owned while the VFW, bowling alley, golf course and bars are all white owned. Didn’t the Guthrie police department just go through something similiar for racially profiling? How embarrassing for the city and county, why the sheriff stands all proud in that truck. For the law to allow the illegal gambling machine business to get as established as it has in Oklahoma is highly questionable. Then one day the law confiscates long established illegal machines loaded with cash without making any arrests? Let it grow until it is worth enough, and then seize the cash? Arrests need to occur at the same time seizures occur. Have any of you who are complaining ever call and told the police about the machines. If not then who are you to throw stones? Not saying they should have sat back for so long but we all play a part and if enough people would have complained and demanded something be done then it may have happened quicker. All elected officials look for photo ops around election time. With 25 years of law enforcement experience I know that gambling tends to take a back seat to other more serious crimes until some prominent citizen complains. There simply aren’t enough resources to enforce every single law on the books, so the squeaky wheel gets the grease as it were. These businesses and others were warned to get rid of these machines and after they continued operations something was done. The article says the investigation is continuing which means other locations will likely get a similar visit from the uhaul truck. Whether law enforcement has time to enforce that particular law or not, gambling is still illegal in Oklahoma other than the obvious exceptions at casinos etc. The claims of election year politics and racially motivated enforcement, by supporters of the other candidates (including the one who recently lost) are based on bias rather than fact. Honestly speaking, those types of machines have been around for so long and out in the open so obviously, my wife and I figured they had discovered some kind of loophole in the law. Still, if any laws were broken, they were not broken by the machines. Upholding the law would seemingly need to involve something other than just seizing machines. lol, These machines have been here for years, why now? If this IS racial profiling I know who I Wont be voting for, Hint: Theft, drug trafficking, child abuse, hate crimes are Real issues that need to be adresses…..but a little gambling? Tax dollars could be better spent in my opinion. They will not bust country club, VFW or any Bars for these machines since they all are owned by the white. These machines been in Logan county for decades. Why this is an issue now? they could have sent a letter to all the business owners to remove them like they did in the case of K2. I strongly think that Sheriff’s actions are based on racial profiling! Law should be enforced equally. I will not vote for this racist Sheriff again. They are still gambling in the bars, country club, golf coarse, and VFW. VFW is like a small casino! I guess they won’t touch those so all the Judges and rich people can do their gambling. You really think people are that stupid and won’t find out what you are up to? After reading the comments, I’m shocked to find the Sheriffs department behaved in this manner! If it’s been openly going on for so long and it’s so widespread and everyone knows about it, I can see how store owners would think it’s legal or at least a grey area. I think the more responsible action would have been for the Sheriff’s department to send a letter explaining why the machines are illegal and you have x amount of time to remove them. I think what will happend with the VFW will be the same thing that happened in Chickasha a few years back. The OSBI will catch the sheriff protecting their own. Now that this is all in the open, there will be more bust even if the sheriff doesn’t. Since people are starting to throw out the race issue it will all be exposed. One of the deputy sherif’s wife works at the VFW, she got the phone call ahead of a time so they can lock their doors. I was there when that all happened. Facts are facts, i wonder how they will get away with this?? I wonder if these raided stores all received a written cease and desist order or request. Sounds like they may have been “warned”. But were they warned properly? Imagine if a Sheriff was, himself, involved in an illegal gambling operation. What process is in place to stop him from just eliminating his competition? I would hope the legal process. I talked to the store owners and none of them received any verbal or written warning from the Sheriff’s dept. You will be surprised to know one of the deputy sheriff “D” was a regular customer on those games. @ Jim Serving the community properly should have involved legal written notices. That would have allowed store owners time to take corrective action to avoid seizures and possible arrests. This whole thing just seems so bizaar to me. I am ashamed to live in a county that would rather elect an aparent photo opting sophomoric bully than a decent Sheriff. This sheriff has been against small businesse. He been harassing south logan county business from day one. Now he messed with city businesses. Don’t he understand that business along with other tax payers pays for his salary. I hope people will make right choice this time. I am a voter and resident of Logan County. Since this is a public forum, I would like to ask you few questions regarding phone cards game bust you did last month. I am very confused and disappointed concerning the actions you have taken in recent weeks in regards to removing phone card games from local businesses. It appears you have targeted several businesses owned by minorities while doing little or nothing to businesses and organizations owned by whites that have the same games on their property. In regards to this, could you answer the below questions to clear up any confusion the voters might have. 1. Why have these games been over looked for more than 10 years? Why did you wait almost 4 years to take action waiting until right before elections? 2. Why did you target the business owned by minorities when the same types of games were in other locations including but not limited to Bars, Golf Clubs and VFW? 3. Why did business owned by whites or “Good ol Boys” get fair warning to remove the games while businesses owned by minorities got surprise S.W.A.T. style raids? 4. Why didn’t minority owned business get the same warning as other businesses owned by whites? 5. Is it true you only messed with the minority businesses and not the businesses owned by whites because you were afraid of losing their votes? 6. Is it true one of your deputy’s wife works for VFW, which is known to have a huge game room (that pays out cash prizes) for decades? If so, how is it possible you were not aware of this game room? 7. One of your deputies was regular on the games. Given this information, it appears your office has the attitude that certain activities are ok for the Sheriff and his deputies but against the law for the regular citizens. Why do you think the Sheriff’s Department is above the law? 8. These raids conveniently occurred just a few months before elections and you are seen posing rather proud and smug in pictures with the games. Were your actions election motivated and a desperate attempt for a photo opportunity? 9. Do you agree that law should apply equally to everyone regardless of his or her race? If so, your actions have proven otherwise. This is very important that you answer these questions here so all the residents of Logan county can see them. Thanks.